As the Gayle Greve Hunt School of Nursing (GGHSON) continues to grow its student body, the school has announced a second concurrent enrollment agreement with the Dallas County Community College District (DCCCD). Students working toward their Associate Degree in Nursing (A.D.N.) at Mountain View College in Dallas can now begin to earn credit toward a Bachelor of Science in Nursing (B.S.N.) at the GGHSON. Brookhaven College, just outside Dallas in Farmers Branch, Texas, already has a dual enrollment agreement with the GGHSON. 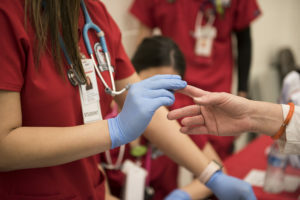 Thanks to a new dual enrollment program with the Gayle Greve Hunt School of Nursing, students working toward their associate’s in nursing at Mountain View College in Dallas can now begin to earn credit toward a Bachelor of Science in Nursing (B.S.N.) at the GGHSON. Manny Santa-Cruz, D.N.P., M.B.A., R.N., assistant dean and chair of undergraduate programs at the GGHSON, said the agreements are the result of efforts to expand the footprint of the nursing program in El Paso around the state. Students at the two DCCCD schools can complete up to six credit hours of the GGHSON’s R.N. to B.S.N. program while they are enrolled in their associate degree program, said Gretchen Ruiz, unit manager, GGHSON Student Affairs. The program will help create a pipeline allowing students of the two community colleges to make a smooth transition into the GGHSON’s bachelor’s program. As the GGHSON continues to push nursing education forward in El Paso, the school also recently welcomed its first five Master of Science in Nursing (M.S.N.) students. The newest degree program to be offered at TTUHSC El Paso will prepare students to assume leadership roles in health care organizations. With courses in business, finance and policy, a major goal of the M.S.N. program is to ensure that nurses have a seat at the table in a health care system that is increasingly focused on interprofessional collaboration. The M.S.N. is a hybrid program, meaning students will learn in online, classroom and community settings (as part of their practicum). Throughout the program, students will learn from faculties in TTUHSC El Paso’s nursing, medical and biomedical sciences schools—an opportunity that can only be provided at a health sciences center.